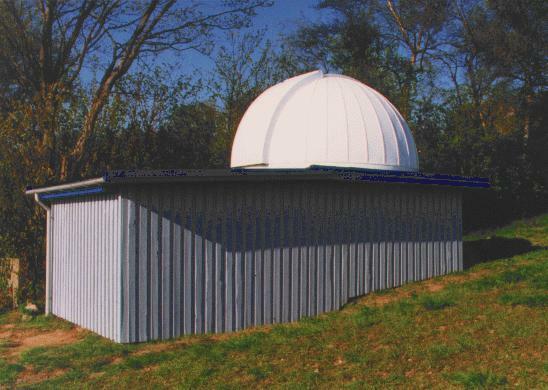 Boserup Amateur Observatory, Denmark homepage. Boserup Amateur Observatory, or BAO in short (pronounced like "SAO" in "SAOimage") is an observatory run on an amateur basis, located near the village of Boserup on southern Sealand. The site is quite dark so we are able to make some pretty good deep-sky images. The project was started in 1987 by Michael Andersen and Kim Birkelund, and soon after it was joined by Jacob Clasen, Søren Larsen. and Bjarne Lassen. Spoil your eyes by letting them browse through these pictures! We have collected our finest pictures here for you to see. Here you will find all the best pictures of Mars made at BAO. On this page we present the best of our Jupiter pictures. This is a list of the objects we have observed with the CCD camera. It should be more or less complete. Get a glimpse of the BAO spirit by browsing through a few selected pages from the logbook. This is in Danish, sorry. The observation of SN 1993J was one of the more serious projects at BAO. We followed SN1993J from it was discovered in april 1993 until the fall of 1994. A description of the BAO Software and Hardware Divisions and some of the projects that are currently running. This page contains information on the instruments in use at BAO. The BAO Telescope Control System. .
A more comprehensive description of the telescope control system at BAO. It was last updated: March 23, 2012.